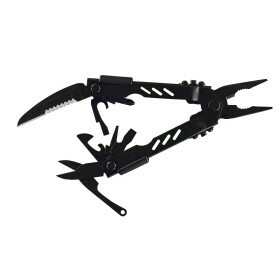 Gerber Compact Multi-Plier » Protective Solutions, Inc. The Compact Multi-Plier 400 is Gerber's most popular tool. This ultra-compact workhorse brings all the same functionality and rugged performance characteristics of its bigger Gerber brother thanks to its stainless steel hardware, and its Fiskars scissors which have the wherewithal to cut through seat belts. And thanks, as well, to the patented design of its one-handed opening pliers. The Compact is unmatched for strength, durability and ease of use. Gerber's patented Saf.T.Plus locking system is your assurance that this little guy more than holds its own in the name safety.